This is like that green smoothie you love so much — except this one’s vegan. Not throwing shade on any other ‘shamrock shake’ you may be consuming around St. Paddy’s Day, but this is not that shake. This one is creamy and green, and a darn delight, but that’s where the comparisons end. 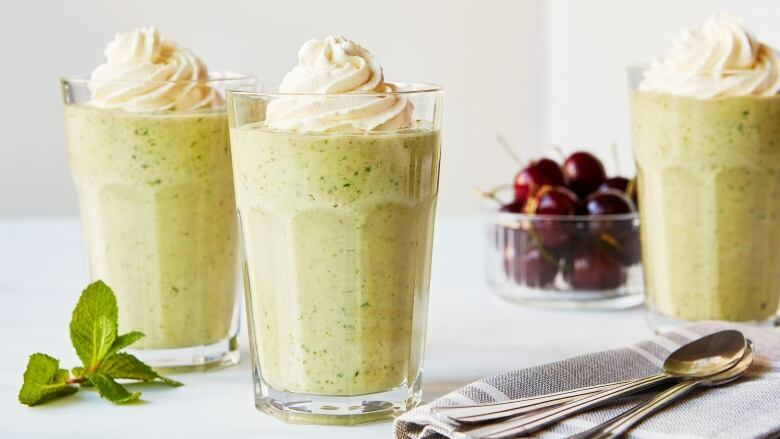 With avocado, spinach and bananas, this has more in common with your uber-healthy green smoothie, and this one, right down to that (coconut cream) whipped topping, is dairy-free. Top of the morning! This healthy and dairy-free take on a classic mint milkshake is a great way to start the day. While you can absolutely use almond milk or soy milk in place of the coconut milk, the shake will not be as thick. You can use 3 bananas for thicker texture in any case. In blender, puree the spinach, avocado, bananas, coconut milk, ice, dates, mint leaves, mint extract, vanilla and salt until smooth. Pour into glasses. Dollop with whipped coconut cream. Garnish with cherries and mint sprigs.